Two sets of wickets shall be pitched opposite and parallel to each other in the centres of the bowling creases. Each set shall be 9 in/22.86 cm wide and shall consist of three wooden stumps with two wooden bails on top. 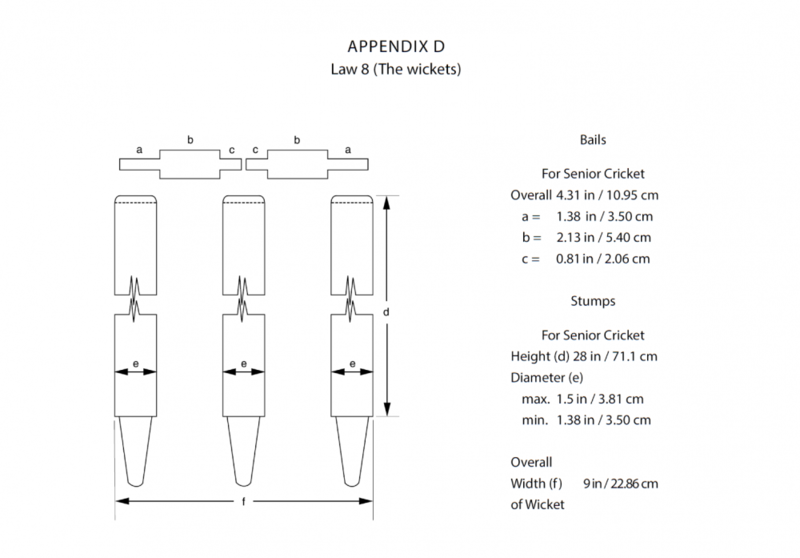 See Appendix D.
The tops of the stumps shall be 28 in/71.12 cm above the playing surface and shall be dome shaped except for the bail grooves. The portion of a stump above the playing surface shall be cylindrical apart from the domed top, with circular section of diameter not less than 1.38 in/3.50 cm nor more than 1.5 in/3.81 cm. See Appendix D.
- shall not project more than 0.5 in/1.27 cm above them. - shall fit between the stumps without forcing them out of the vertical. Shorter spigot - 0.81 in/2.06 cm. 8.3.3 The two spigots and the barrel shall have the same centre line. 8.3.4 Devices aimed at protecting player safety by limiting the distance that a bail can travel off the stumps will be allowed, subject to the approval of the Governing Body for the match and the ground authority. The Governing Body for Cricket in the country concerned shall determine the dimensions of the stumps and bails and the distance between the wickets. The umpires may agree to dispense with the use of bails, if necessary. If they so agree then no bails shall be used at either end. The use of bails shall be resumed as soon as conditions permit. See Law 29.4 (Dispensing with bails).